It’s kind of like a home-country dining room, it’s peaceful, slightly elegant, like a cross between a Denny’s and an Irish pub… that is in ambiance, and ambiance alone. The food is of pilgrimage worthy status. 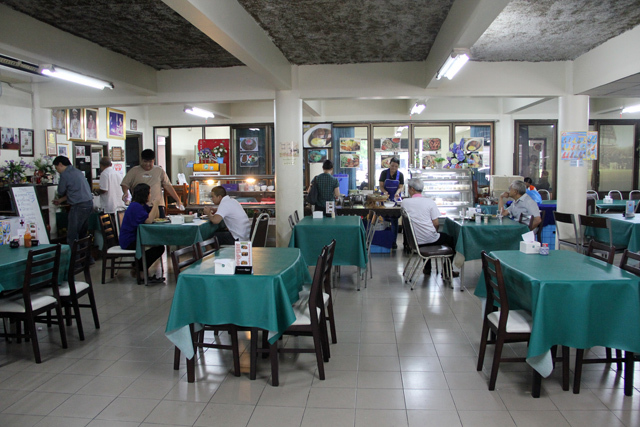 At Krua OV (OV Kitchen) ครัว OV, they make a selection of curries and prepared Thai dishes known as Khao Gaeng, and among the selection are a number of royal Thai dishes on the menu. 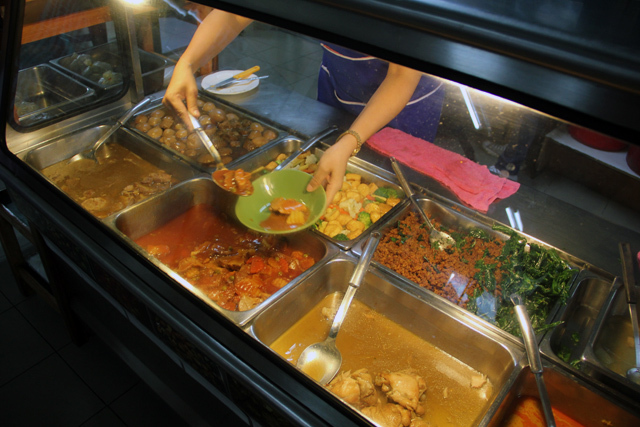 Just like the masses of Bangkok street food stalls that fill the sidewalks around town, this restaurant has a typical glass cabinet filled with tantalizing curries. 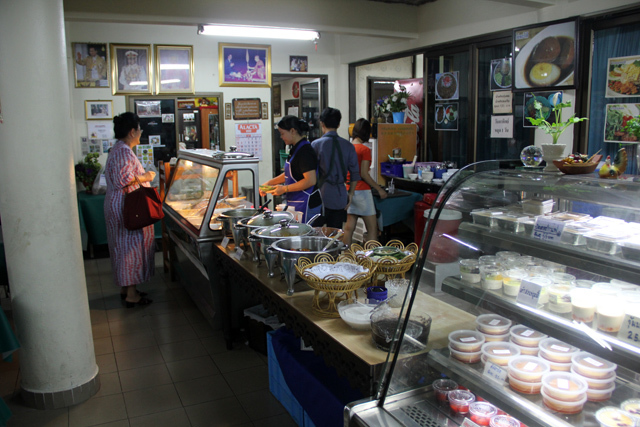 They also occasionally serve kanom jeen noodles, have a menu selection with a few more dishes like the popular royal Thai dish of Khao Chae (ข้าวแช่), and a fridge full of traditional Thai desserts and sweets. I couldn’t wait to get started eating! 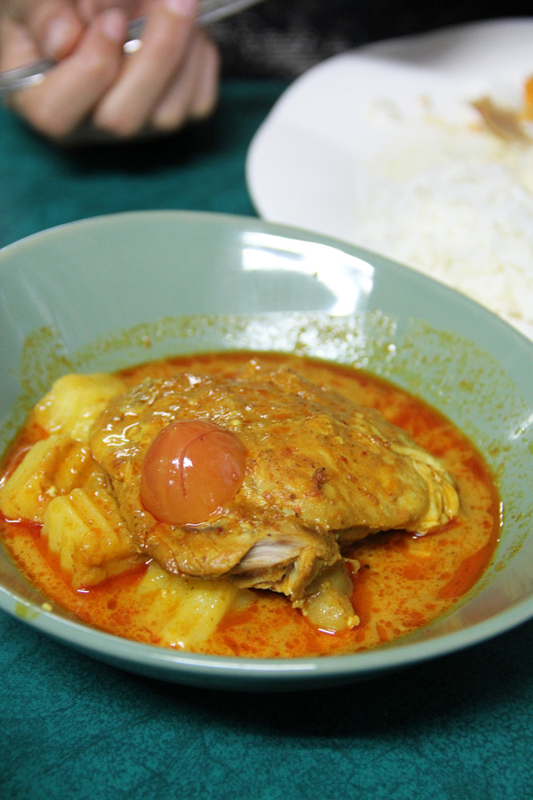 How could anyone resist getting an order of their Gaeng Garee Gai (แกงกะหรี่ไก่), a chicken curry that’s similar to massaman, but a little stronger with spices? One of the well known dishes at Krua OV (OV Kitchen) ครัว OV, is Pla Duk Foo Pad Prik King (ปลาดุกฟูผัดพริกขิง). 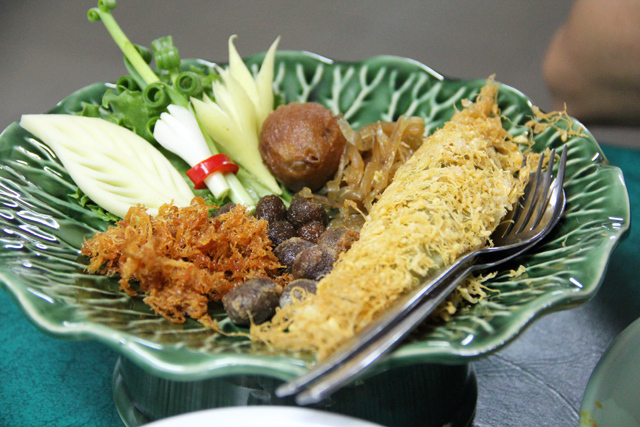 Now I’m sure you’ve eaten yam pla duk foo many times, and this dish is similar, yet quite different. The crispy catfish was crunchy, sweet, and nicely flavored with ginger. 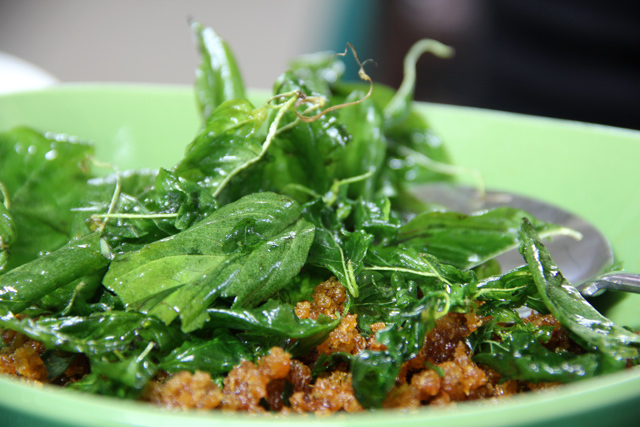 On top of all the crispies were fried basil leaves, adding a superb extra crunch and fragrance to the dish. They’re also particularly praised for their version of Kai Paloe (ไข่พะโล้). 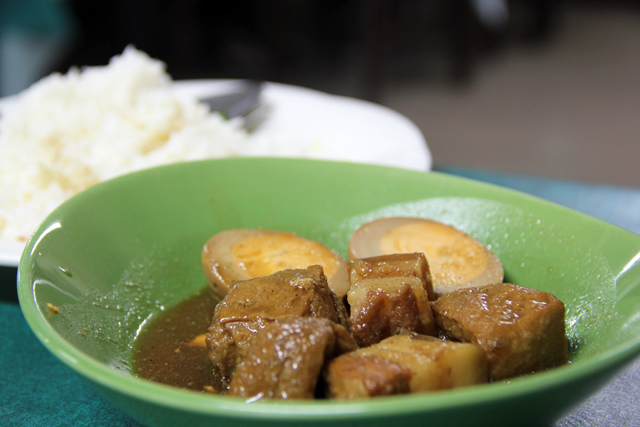 Thick chunks of pork belly, fried tofu, and boiled eggs sit in a rich porky gravy nicely spiced with Chinese five spice. It’s not the world’s prettiest dish, and while it’s a little on the sweet side for me, they did make it extremely well. The pieces of tofu were juicy and fluffy. 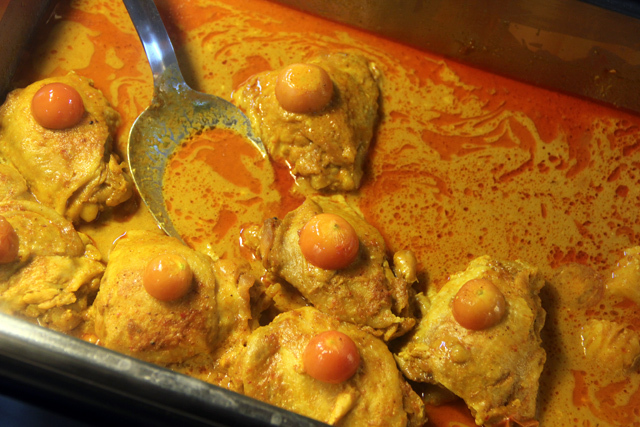 Gaeng Garee Gai (แกงกะหรี่ไก่) was every bit as good as it looks, slightly oily, rich from coconut milk, sweet but not overly so, and nicely seasoned with a curry paste that contains a mix of popular Persian spices. At first I thought it was topped with an egg yolk… but it’s actually a tomato! The combination of all these dishes on my plate conjoined with rice was quite a delicious treat! Finally on to the authentic Royal Thai food dish that’s so popular at Krua OV (OV Kitchen) ครัว OV: Khao Chae (ข้าวแช่). It’s a summer dish, delicately designed to be eaten when it’s hot outside as a cooling and refreshing dish, and that’s exactly what it is. There are a few components to Khao Chae (ข้าวแช่). First of all the rice, which is prepared using the finest jasmine rice soaked in water and jasmine flowers to give it a floral tinge. The rice is served with actual cubes of ice in it. The other more beautiful part of any Khao Chae (ข้าวแช่) are the little dainty sides, most of which are rich and deep fried in lots of oil. Shrimp kapi balls, shredded pork, and my favorite, the green chili stuffed with pork, wrapped in an egg net and deep fried, were among the selection. 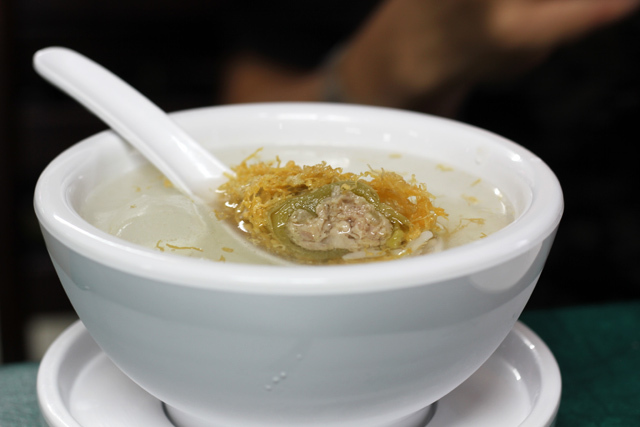 Most of the little sides are sweet and oily in order to go exceptionally well with the icy jasmine rice water. Khao Chae (ข้าวแช่) is an elegant and authentic example of a royal Thai food that was adapted and invented in the Thai royal courts. 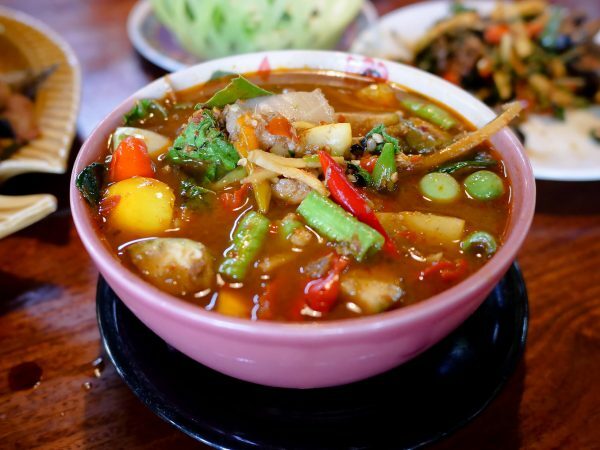 It’s a very unique dish, there’s no other Thai dishes that really can be compared to it, and it really is refreshing and cooling. Some say you’re supposed to take little nibbles of the sides dishes and then chase each bite with a spoonful of icy jasmine rice. However, perhaps not proper, but I quite like a little bite paired at the same time with the fragrant water. The chili stuffed with pork was by far my favorite item. Lastly, an opportunity for dessert is hard to pass up. We got a small dish of Khao Neow Dam Nam Kati (ข้าวหนียวดำน้ำกะทิ), and it was by far the best version I’ve ever had. 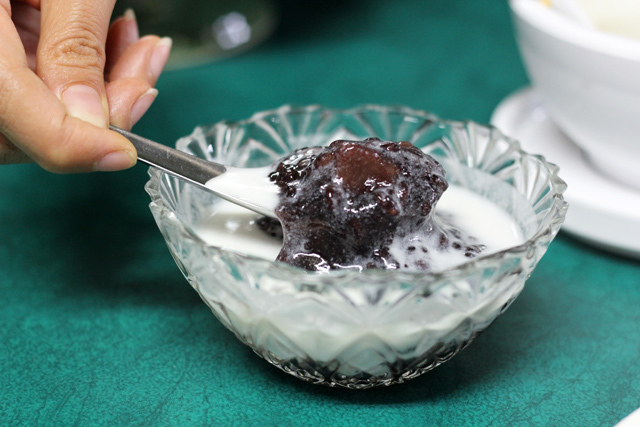 The sticky rice was almost pudding like, slightly warm, and not too sweet. It was contrasted by thick creamy coconut milk, a true sweet treat. 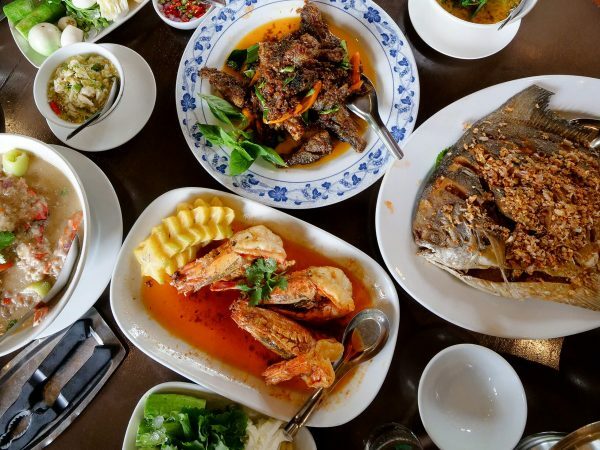 Here’s a video of the entire meal of royal Thai food! Sitting in an old-style dining room with tables draped in dark green table clothes, a glass cabinet full of delicious things to choose from, and a feel of royal elegance, yet still with very reasonable prices… there’s nothing bad to say about this place! The food speaks for itself. 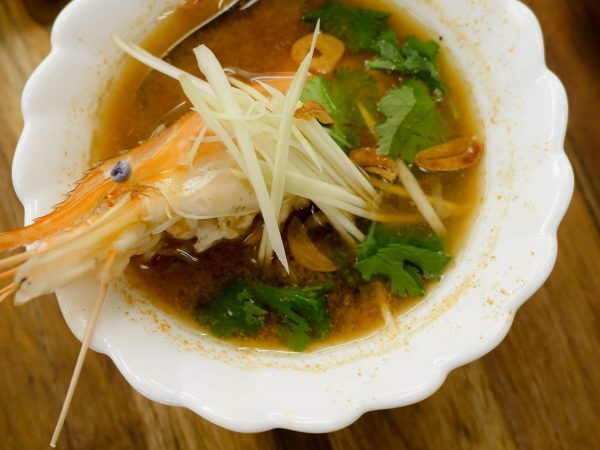 If you’re looking for a unique restaurant that serves Thai food and dishes up some recipes that have been cooked for Thai royalty, this is a top choice. 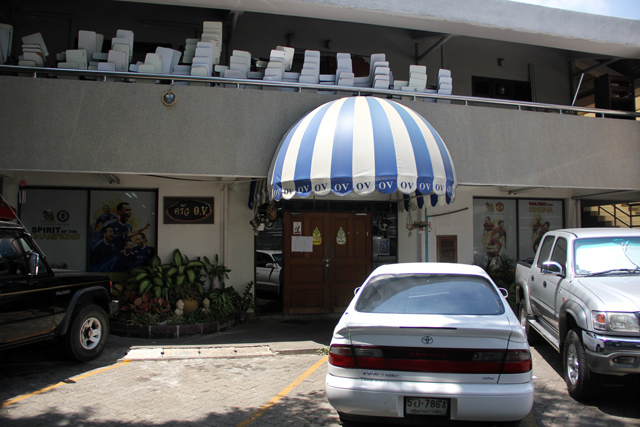 It’s a little tricky, but Krua OV (OV Kitchen) ครัว OV, is located in the royal government area of Dusit, right across the street from the Bangkok zoo. The closest BTS Station is Victory Monument, but from there you need to either take a taxi or a bus down Ratchawithi Road towards Dusit until you get to Thanon Phichai (right across from the zoo). Just a little ways down Thanon Phichai, enter a gate and pass the guard and you’ll see the Irish pub like entrance of the restaurant (see photo above). It’s a very unlikely place for a restaurant, but very worth a visit! Went there at around 7pm last Saturday but the restaurant also told me that those Thai royal dishes are only served in summer(?). Not much food available and the restaurant is quiet at dinner time. Just ordered chicken curry and some pork meatball appetizer! Taste OK but not superb to me! Hi SW, good to hear from you, thank you for sharing. I think maybe they had run out of some of the dishes, but yes usually the khao chae is a summer dish because it’s cooling. I’ll make a note of that on the article. Sorry about that and thank you for sharing. OV Kitchen told me they are thankfull that you “sent” yet another hungry and curious falang (me) their way to be introduced to Royal Thai Cuisine. I loved it. Ah very cool, glad you enjoyed it! Thanks for reviewing this place! We went there last week and it was delicious! It was jam packed with thais because of a huge protest near by but we managed to find a table and proceeded to order just about everything they had out (using the pointing method) plus the khao chae which was really interesting. I’m so glad you included the khao chae in your review because otherwise we wouldn’t have known to order it as there is no english menu. We will definitely return! Hey Rakhal, this is so great to hear, thank you for taking the time to leave a comment. Glad you had such a great food experience at Krua OV! 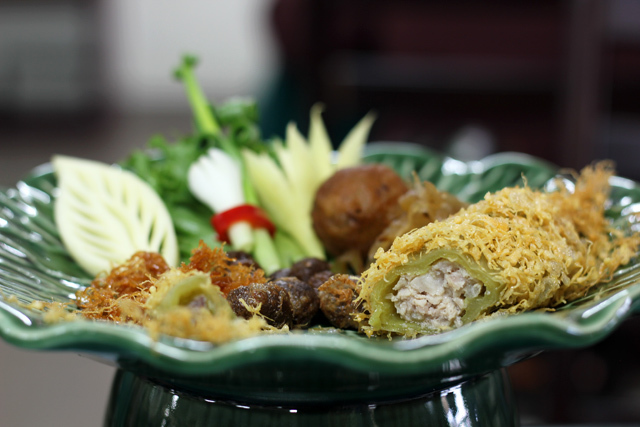 shrimp paste balls…and one of the best parts of the dish,if you ask me. Your directions are a little vague…is it located within the compound of Vachiravudh College? The OV stands for Old Vachirawudh.or alumni. Hey Robert, excellent, thank you for sharing the correct ingredients. Yes, it’s on the compound of the College! Hi Mark ! Thank you very much for this address and review. For our third time in Thailand, it is only this time that i discovered your blog! We are from Mauritius and into adventurous exotic food just like at Krua OV above, full of flavour and a local joint for local people. We arrived late at around 4.30pm and ordered everything you had except the Khao Chae and dessert. The Khao chae they said only available in Summer although now in Aug in Thailand it feels like summer with the hotness:) but we really wanted to try especially the jasmine rice which looks good. Maybe next time. It is true it is hard to find but our driver called before. One thing is that they do not have english menu and thank god i had your review photos on my phone + there are some menu photos on the walls there. However there was also a kind old lady there (owner’s mom) who spoke english and recommended the egg and pork dish. Also very kind, she offered us two special bananas free (which she said is brought to sick people at hospital). 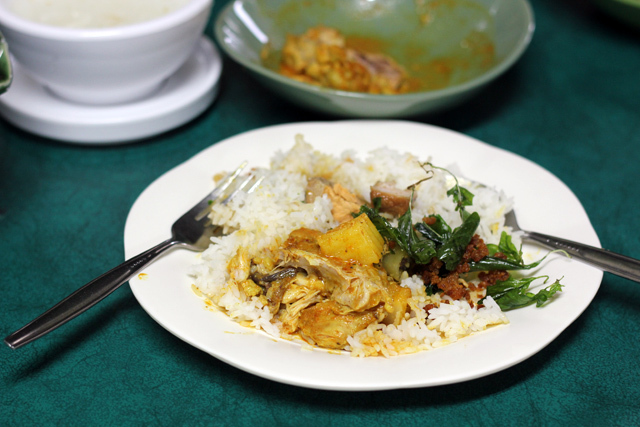 The mixture of rice with the Gaeng Garee Gai, the sweetness of the Kai Paloe and the crispiness of the catfish salad was heavenly. All wolfed down in like 20 min thanks to speedy service and icy Cha Yen. Thank you for recommending this venue which will become a regular haunt on our next visits. At thb300 for 2 persons (lady offered a discount too how sweet and kind! ), we ate till we reached elastic limit but even if this place was more expensive we would still go! Just to also visit the grandma and staff there again who was sooo welcoming( i think she does not see tourists often at the restaurant). We were so full by the time she offered the bananas that we could not order any more dessert. Although i saw on the wall some royal thai dessert pictures, i do not know if they had them. Their display only had european cakes. We are planning to go there before we fly back home next week. Maybe next time you can please do a review of venues which offer similar royal thai food (khao chae) and thai dessert? I would be also very grateful if you could tell us where to buy those bamboo khantoke individual trays in bangkok which only seem to come up with’chiangmai’ on google unfortunately. Also any bookstore carry your eating guide in printed copy? But Thank you thank you for this one! It’s great to hear from you and glad you found Krua OV, it is a little hard to find so glad your driver found it. The food is so good! Yah, too bad they didn’t have the khao cher, it is a summer dish, but I thought maybe they served it year round – but I guess they still remain quite traditional there. I will definitely try to find more places like this to review in the future! Hmm, I’m not sure about the bamboo khantoke, but I’ll let you know if I come across any. As of now, the food guides are only available as pdf ebooks, but possibly in the future!